London mayor Sadiq Khan plans to spend £875m over five years improving the quality of the capital’s air, including £610m on the Ultra Low Emission Zone (ULEZ), and a further £200m boosting step-free access on the Tube. The mayor’s office said the £875m he is committing to tackling the capital’s ‘air quality crisis’ will be more than double the £425m spent by his predecessor, Boris Johnson. Mr Khan said he wanted London to be a 'world leader' in tackling toxic air. The vast bulk of the money will go on an extended ULEZ, which Mr Khan plans to bring in from 2019. Officials said the full ULEZ package, ‘including all associated measures such as rapid charging points, will see £610m of investment overall’. 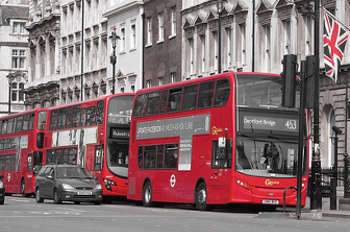 This spending will also include the introduction of Low Emission Bus Zones and the phasing out of diesel-only buses with a commitment to purchase only hybrid or zero-emission double decker buses from 2018. Officials said £312m would be spent on transforming the bus fleet. The mayor’s office said Transport for London (TfL) will also spend £200m making more than 30 more Tube stations step-free by 2021/22, ‘the biggest boost in the network's 153 year history’. The move will bring the number of stations with step-free access to all platforms to more than 100, increasing the proportion from 26% of the Underground network to more than 40%. Ruth Owen, chief executive of charity Whizz-Kidz, said: ‘Public transport is a lifeline for disabled people, but we know that accessibility can be a major barrier for wheelchair users who, like anyone else, just want to get from A to B. Both spending pledges are part of TfL’s draft Business Plan, which will be published this week.